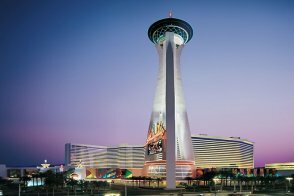 The Stratosphere's casino is nearly as impressive an entity as the tower. 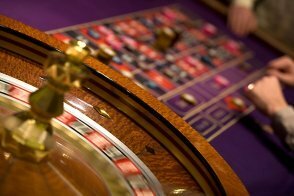 It's one of the larger gaming floors in town and is constantly updated with state-of-the-art slot machines and video technology. 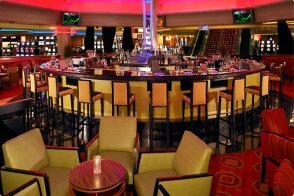 Plus, there's an action-packed race and sports book. 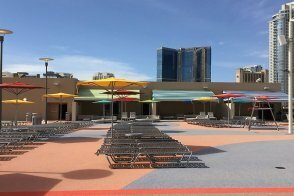 A variety of dining experiences awaits guests of the Stratosphere. Off the casino floor, you can enjoy the charm and tastes of Old World Italy at Fellini's Ristorante Italiano. McCall's Heartland Grill offers steak and seafood with a Midwestern style. Try plate after plate of global cuisine at the Stratosphere's sumptuous buffet. 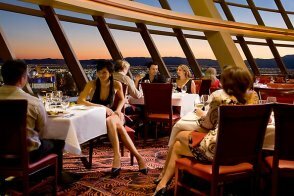 And at Top of the World, indulge in delicious eclectic cuisine while seeing the entire city of Las Vegas from your table. 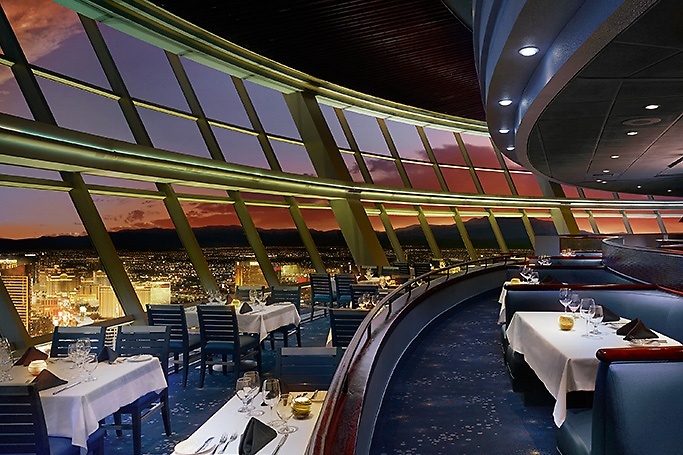 The restaurant's floor rotates, giving guests an exceptional 360-degree view, featuring Mount Charleston, the Las Vegas Strip and beyond. 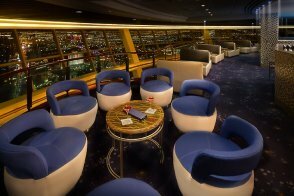 After dining at the Top of the World, head upstairs to the Level 107 Lounge. 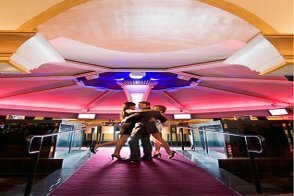 It features live music, great cocktails, appetizers and beautiful views. 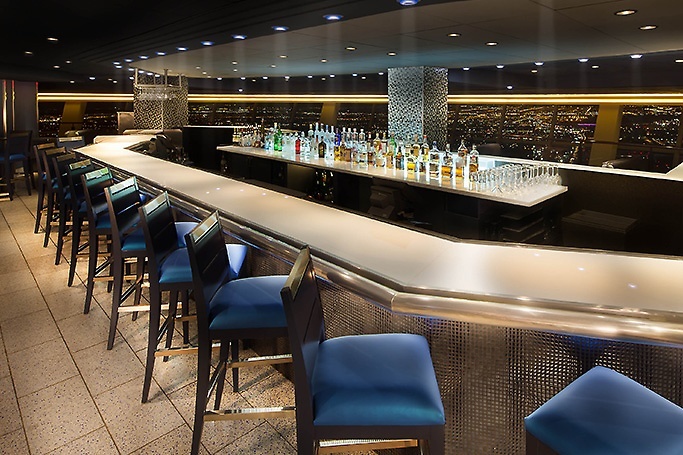 You can also grab a drink at Air Bar on Level 108. You might see an occasional person fly by. Don't worry, you haven't had too much alcohol. 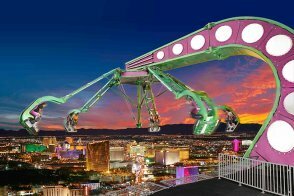 SkyJump, a great attraction for thrill seekers who aren't afraid of heights, is also located on Level 108. Adventurous visitors are strapped into a harness, attached to the "descender machine" and step off a narrow platform only to plunge 855 feet straight down. 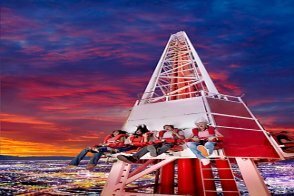 In addition to SkyJump, the Stratosphere boasts a number of other hair-raising attractions including the Big Shot, a seated, shorter but equally thrilling ride, and X Scream, which extends you over the edge of the Stratosphere Tower. The stop is only for a few seconds, but it's long enough to make you appreciate attractions on the first floor. A fourth ride is called Insanity-The Ride. Nothing more need be said! After enjoying the day sampling the resort's many attractions, spend your evening at a show like "MJ Live," a Michael Jackson tribute. Shopaholics will find great deals in the Tower Shops, and those who enjoy being pampered can visit the Roni Josef Salon and Spa. 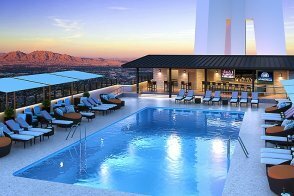 Seasonally, there's the lovely eighth-floor Level 8 Pool where you can catch some rays on an expansive deck, and the 25th-floor Radiusº Rooftop Pool & Wet Lounge (closed for the season) where you can enjoy great views and the daily Sunset Happy Hour. 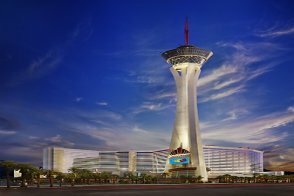 Whether it's great heights, great attractions or a great show you're looking for, the Stratosphere has an abundance of amenities to enjoy. 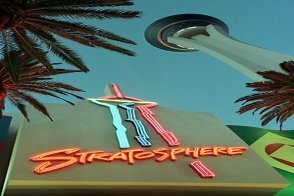 The Stratosphere has the following dining options: Top of the World, McCall's Heartland Grill, The Buffet, Strat Cafe & Wok, Fellini's Ristorante Italiano and Starbucks. Entertainment includes MJ Live, a tribute show to Michael Jackson. 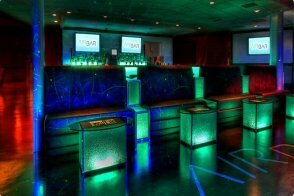 Yes, the C Bar, Air Bar and Level 107 Lounge. 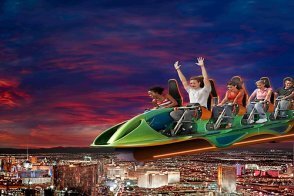 Yes, Big Shot thrill ride, SkyJump Las Vegas, Insanity - The Ride, X-Scream and the Stratosphere Tower itself. Yes, the Chapel in the Clouds offers a number of wedding ceremony packages. Concierge, currency exchange, luggage and maid service, safety deposit boxes, wake-up calls. 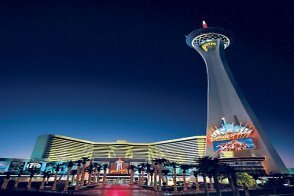 Resort fee Stratosphere has a $37.40 per room, per night resort fee. This fee is not included in your reservation and will be collected by the hotel. 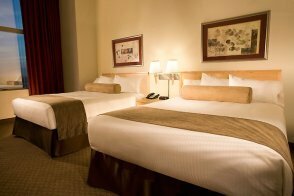 This deluxe guestroom has two queen beds with luxury triple sheeting. The room's décor is contemporary. There is a work area with a desk and a flat-screen TV among the standard room amenities. The bathroom has a single sink and combined tub/shower. 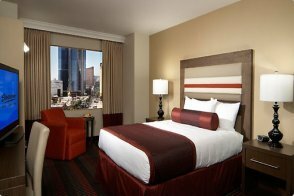 This room has one king bed with luxury accommodations and modern fixtures. There is also a 55-inch flat-screen television, an in-room safe, a refrigerator and a halo-lit custom headboard. The bathroom has a walk-in shower with frosted glass. This suite measures 775 square feet and features a king bed, marble floor in the entrance, desk, sitting area, wet bar and a sofa with a hideaway bed. The bathroom has a spa tub and separate shower. This room measures 350 square feet and has one king bed with duvets and triple sheeting. The room's décor is modern. 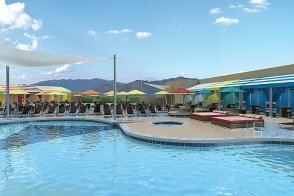 It's located on one of the higher floors, providing panoramic views of the Las Vegas valley and mountains. Other amenities include a compact refrigerator, coffee maker and 55" HD flat screen TV. The bathroom has a single sink and a walk-in shower. 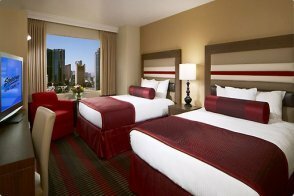 Perfect for discerning travelers or a fun girls' night out, this luxury grand suite features a separate bedroom that has a king bed with premium bedding. In addition, there's a living room with a dining area and a wet bar. The bathroom is spacious and provides the ideal environment for relaxation. This room has two queen beds with luxury accommodations and modern fixtures. There is also a 55-inch flat-screen television, an in-room safe, a refrigerator and a halo-lit custom headboard. 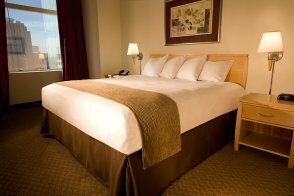 This room has one king bed with luxury accommodations and modern fixtures. There is also a 42-inch flat-screen television, an in-room safe and an MP3 alarm clock. The granite bathroom has a single sink and a combined tub/shower. This room has two queen beds with luxury accommodations and modern fixtures. There is also a 42-inch flat-screen television, an in-room safe and an MP3 alarm clock. This room has two queen beds with duvets and triple sheeting. The room's décor is modern. Other amenities include a compact refrigerator, coffee maker and 55" HD flat screen TV. 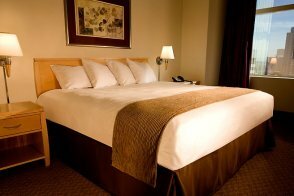 This deluxe guestroom measures 350 square feet and has one king bed with duvets and triple sheeting. The room's décor is contemporary. There is a work area with a desk among the standard room amenities.